The Seven Cities: According to Brewer’s Reader’s Handbook, seven cities are regarded as the great cities of all time, namely Alexandria, Jerusalem, Babylon, Athens, Rome, Constantinople, and either London (for commerce) or Paris (for beauty). It is that time of morning, not quite night, not quite day, when the sky is a field of smudged grey, like a page of erased pencil marks, and in the empty city streets a hushing sound can be heard—an ever-present background sigh, audible only when all else is silent. It is that hour of dawn when the streetlamps flicker out one by one like heads being emptied of dreams, and pigeons with fraying, fume-coloured plumage open an eye. It is that moment when the sun, emerging, casts silvery rays and long shadows, and every building grows a black fan-shaped tail which it drapes across its westward neighbours. One building casts a broader shadow, darkens more with its penumbra, than any other. It rises at the city’s heart, immense and squat and square. Visible for miles around, it would seem to be the sole reason for which the houses and tower blocks and factories and warehouses around it exist. Hard rains and hot summers have turned its brickwork the colour of dried blood, and its roof is capped with a vast hemispherical glass dome that glints and glimmers as it rotates ponderously, with almost imperceptible slowness. Hidden gearings drive the dome through one full revolution every twenty-four hours. Half of it is crystal clear, the other half smoked black. The building has seven floors, and each floor is fourteen metres high. Its sides are just over two and a half kilometres long, so that it sits on seven million hectares of land. With its bare brick flanks it looks like something that weighs heavy on the planet, like something that has been pounded in with God’s own sledgehammer. This is Days, the world’s first and (some still say) foremost gigastore. Inside, Days is brackishly lit with half-powered bulbs. Night watchmen are making their final rounds through the store’s six hundred and sixty-six departments, the beams of their torches poking this way and that through the crepuscular stillness, sweeping focal haloes across the shelves and the displays, the cabinets and the countertops, the unimaginably vast array of merchandise that Days has to offer. The night watchmen’s movements are followed automatically by closed-circuit cameras mounted on whispering armatures. The cameras’ green LEDs are not yet lit. Across the dollar-green marble floors of the store’s four main entrance halls janitors drive throbbing cleaning-machines the size of tractors, with spinning felt discs for wheels. The vehicles whirr and veer, reviving the marble’s oceanic sheen. At the centre of each entrance hall, embedded in the floor, is a mosaic, a circle seven metres in diameter divided into halves, one white, one black. The tesserae of the white half are bevelled opals, those of the black half slivers of onyx, some as large as saucers, some as small as pennies, all fitted intricately together. The janitors are careful to drive over the mosaics several times, to buff up the precious stones’ lustre. At the centre of the gigastore, tiered circular openings in each floor form an atrium that rises all the way up to the great glass dome. The tiers are painted in the colours of the spectrum, red rising to violet. Shafts of light steal in through the dome’s clear half, reaching down to a fine monofilament mesh level with the Red Floor. The mesh, half a kilometre in diameter, is stretched tight as a drum-skin above a canopy of palms and ferns, and between it and the canopy lies a gridwork of copper pipes. With a sudden hiss, a warm steamy mist purls out from holes in the pipes, and the tree canopy ripples appreciatively. The water vapour drifts down, growing thinner, fainter, sieved by layers of leaves and branches, to the ground, a loamy landscape of moss, rock, leaf mould and grass. Here, at basement level, lies the Menagerie. Its insects are already busy. Its animals are stirring. Snarls and soft howls can be heard, and paws pad and undergrowth rustles as creatures great and small begin their daily prowling. Outside Days, armed guards yawn and loll blearily at their posts. All around the building people lie huddled against the plate-glass windows that occupy the lower storey, the only windows in the building. Most of them sleep, but some hover fitfully in that lucid state between waking and dreaming where their dreams are as uncomfortable as their reality. The lucky ones have sleeping bags, gloves on their fingers, and shawls and scarves wrapped around their heads. The rest make do with blankets, fingerless gloves, hats, and thicknesses of begged, borrowed or stolen clothing. And now, at last, as six o’clock approaches, over at the airport to the west of town a jet breaks the city’s silence. Its wingtips flaring like burnished silver in the low sunlight, it leaps along a runway, rears into the air and roars steeply skyward: the dawn shuttle, carrying yet another fuselage-full of émigrés westward, yet another few hundred healthy cells leaving the cancerous host-body of the motherland. The echo of the plane’s launch rumbles across the rooftops, reaching into every corner of the city, into the deeps of every citizen’s mind, so that collectively, at four minutes to six, as is the case every morning, the entire population is thinking the same thing: We are a little bit more alone than yesterday. And those who continue to sleep are troubled in their dreams, and those who come awake and stay awake find themselves gnawed by dissatisfaction and doubt. And still the day remorselessly brightens like a weed that, no matter what, will grow. The Seven Sleepers: Seven noble youths of Ephesus who martyred themselves under the emperor Decius in 250 A.D. by fleeing to a cave in Mount Celion, where, having fallen asleep, they were found by Decius, who had them sealed up. The brass hands on the alarm clock on Frank Hubble’s bedside table divide its face in two. The perfect vertical diameter they form separates the pattern on the clockface into its component halves, on the left a black semicircle, on the right a white. A trip-switch clicks in the workings and the clock starts to ring. Frank’s hand descends onto the clock, silencing the reveille almost before it has begun. He settles back, head sighing into duck-down pillows. The roar of the departing shuttle is now a distant lingering murmur, more remembered than heard. He tries to piece together the fragments of the dream from which he was summoned up by the knowledge that the alarm was about to go off, but the images spin elusively out of his grasp. The harder he reaches for them, the faster they hurtle away. Soon they are lost, leaving him with just the memory of having dreamed, which, he supposes, is better than not dreaming at all. The street below his bedroom window is startled by the sound of a car’s ignition. The window’s russet curtains are inflated by a breeze then sucked flat again. Frank hears the timer-controlled coffee machine in the kitchen gurgle into life, and moving his tongue thirstily he pictures fat brown droplets of a harsh arabica blend dripping into the pot. He waits for the sharp odour of brewing coffee to creep under the bedroom door and tweak his nose, then, with a grunt, unpeels the bedcovers and swings his legs out. He sits for a while on the side of the bed gazing down at his knees. He is a medium-sized man, well-proportioned and trim, although the years have worn away at his shoulders and put a curve in his upper vertebrae so that he suffers from a permanent hunch, as though he is saddled with a heavy, invisible yoke. His face is as rumpled as his pyjamas, and his hair is a grey that isn’t simply a dark white or a light black but an utter absence of tone. His eyes, too, are grey, the grey of gravestones. In a bathroom whose midnight blue walls are flecked with stencilled gold stars, Frank urinates copiously into the lavatory bowl. Having pushed the flush and lowered the lavatory lid, he fills the basin with steaming-hot water, soaks a flannel and presses it hard against his face. Though his skin stings in protest, he holds the flannel in place until it cools. Then he lathers on shaving foam from a canister marked prominently with the same back-to-back semicircles of black and white as on the face of the alarm clock, and with a few deft strokes of a nickel-plated razor he is unbristled. He has his shaving down to such a fine art that he can leave his face smooth and nick-free without once consulting the mirror in front of him. Frank fears mirrors. Not because they tell him he is old (he knows that), nor because they tell him how worn and weary he looks (he has resigned himself to that), but because, of late, mirrors have begun to tell him another truth, one he would rather not acknowledge. Still, it has become part of his pre-breakfast ablutions to confront this truth, and so, resting his hands on the sides of the basin, he raises his head and looks at his reflection. Or rather, looks for his reflection, because in the mirror he sees nothing except the star-flecked, midnight blue bathroom wall behind him. Fighting down a familiar upsurge of panic, Frank concentrates. He is there. He knows he is there. The mirror is lying. He can feel his body, the organic life-support machine that keeps his mind going. He knows there is cool floor beneath his bare feet and porcelain basin in his hands because nerve-endings in his skin are reporting these facts to his brain, and fitted tightly and intricately into that skin is the configuration of flesh and bone and vein and sinew that is uniquely Frank Hubble. The air that slides over his lips as he breathes in and out tells him that he exists. He feels, therefore he is. But the mirror continues to insist that he is not. He fixes his gaze on the point in space where his eyes should be. His mind is descending in an express lift, swooping vertiginously down towards a dark well of insanity where writhe not gibbering demons but wraiths, a blizzard of wraiths who float soundlessly, mouth hopelessly, twisting around each other, oblivious to each other, invisible to each other. Neither guilt nor shame, the common demons, terrify Frank. What he fears most is anonymity. The nameless wraiths flutter like intangible moths. Nothing is appearing in the mirror. Today, of all days, may be the day that he is finally swallowed up by the emptiness inside him. Unless he can visualise himself, he will be gone. Lost. Forgotten. He has to remember his eyes. If the eyes fall into place, he will be able to piece together the rest. Gradually, with considerable effort, he makes two eyes emerge from the reflected wall, first the grave-grey irises, then their frames of white. He makes the eyes blink, to prove they are really his. Now the lids appear, purple and puffy with sleep and age. Now he shades in two eyebrows of the same smudgy, forgettable grey as his hair. His forehead follows, and quickly the rest of his face falls into place—fisted nose, fettered jaw, furrowed cheeks, foetal ears. Below his chin he has a neck, below his neck a collarbone that reaches to both shoulders from which drop arms that end in basin-bracing hands. The stripes of his pyjama jacket are sketched out in jagged parallel lines. On the breast pocket a stitched monogram of the divided black-and-white circle manifests itself. He can see everything of himself that is visible in the mirror. The struggle is over again for another day. But it is not with relief that Frank turns away from the basin. Who knows—the moment he takes his eyes off his reflection, perhaps it vanishes again. Behind our backs, who knows what mirrors do? It is a question Frank prefers not to ponder. Leaning over the bath, he levers up the mixer tap, and a fizzing cone of water spurts from the head of the shower. The mixer tap is marked with a black C on a white semicircle next to a black semicircle with a white H. Frank adjusts the water to a medium temperature, divests himself of his pyjamas, and steps into the bath, ringing the shower curtain across. The shower curtain, the flannel Frank uses to scrub himself, the bottle from which he squeezes out a palmful of medicated shampoo, his unscented soap, all sport the divided-circle logo, as do the bathmat he steps out onto when he has finished showering, the towel with which he dries his body off, and the robe he drapes around himself. The logo, in various guises and sizes, appears on no fewer than forty-seven different fixtures, fittings, and items of toiletry in the bathroom. Even the treacherous mirror has a coin-sized one etched into its corner. Warm-skinned and tinglingly clean, Frank shuffles into the kitchen, using his fingers to comb his hair into a lank approximation of how it will look when dry. The timing of the ritual of his mornings is so ingrained that as he enters the kitchen, the last few drips of coffee are spitting into the pot; he can pick up the pot and pour out a mugful straight away. Blowing steam from the rim of the mug, he opens the blinds. Staring out at the hazy silver city, he takes his first sip of coffee. Usually Frank admires the view for all of three seconds, but this morning he takes his time. Even though the present position of every building, thoroughfare and empty rectangle of demolished rubble is familiar to him and forms part of a detailed and constantly updated mental map, he feels that, for posterity’s sake, he ought to make a ceremony out of this act of observation, so that in years to come he will remember how every morning at 6.17, for thirty-three years, he used to stand here and stare. He suspects that all day long he will be highlighting mundane little moments like this, tagging the regular features of his daily routine which under normal circumstances he would perform on autopilot but which today he will fetishise as a long-term convict whose sentence is coming to an end must fetishise his last tin-tray meal, his last slopping-out, his last roll-call. Though it will be sweet never to have to do these things again, it will also be strange. After thirty-three years, routine has become the calipers of Frank’s life. He hates it, but he isn’t sure that he’s going to be able to manage without it. So, consciously and conscientiously he gazes out at a view that he has seen thousands of times before, either in the dark or in the false dawn or in broad daylight. He observes the thick-legged flyover, the spindly section of elevated railway along which a commuter train crawls like a steel caterpillar, the whole treeless, joyless expanse of flat-roofed concrete estates and crumpled, clustered houses. As with all employee apartments, the windows also offer him a view of Days, the distant store’s upper storeys lying like a lid over the city, but by lowering his head just a little, he can block it out of sight behind the rooftops. Now he feels he has gazed enough. Into his otherwise tightly timetabled rising ritual he has factored two minutes of slack so that, unless there is a major hold-up, he is never late leaving the building. He has used up one of those minutes, and it is wise to keep the other in hand in case of emergency. It vaguely amuses him that he should be worrying about arriving late for work on what he fully expects to be his last day at Days, but a habit of thirty-three years’ standing is hard to break. How long will it take, he wonders, for the robot in him to adjust to life after Days. Will he wake up punctually at six every morning until he dies, even if there is nothing to get up for? Will he continue to take his coffee-break at 10.30, his lunch-break at 12.45, his tea-break at 4.30 in the afternoon? The patterns stamped into his brain by years of repetition will be difficult to reconfigure into something more suited to a leisurely lifestyle. For more than half his life he has been locked into a groove like a toy car, travelling the same circuit six days a week. Sundays have been days of disjointed lethargy: waking at six as usual, he passes the hours snoozing, reading the newspapers, watching television and generally feeling sleepy and out of sorts, his body unable to assimilate the hiccup in its circadian rhythm. Is that what his life will be like after he resigns? One long chain of Sundays? Well, he will have to deal with that when it happens. For now, he has today—a Thursday—to contend with. He inserts a slice of bread into a chrome pop-up toaster which, with its vents and lines, calls to mind a vintage automobile. On the counter beside it sits a portable television set, which he switches on. Both toaster and television, needless to say, have the back-to-back D’s of the Days logo stamped on their housings. The television is programmed so that whenever it comes on it automatically tunes in to the Days home-shopping channel. A pair of wax-faced women of indeterminable age are rhapsodising over a three-string cultured-pearl choker from the Jewellery Department, while a computer-generated simulation of the interior of the world’s first and (possibly) foremost gigastore planes sea-sickeningly to and fro behind them. With a click of the remote control, Frank cuts to a news channel, and watches a report on the construction of the world’s first terastore in Australia—official title: the Bloody Big Shop. Intended to serve not just Australia and New Zealand but the Pacific Rim countries and South-East Asia as well, the Bloody Big Shop is an estimated eighteen months from completion but still, in its skeletal state, challenges its immediate neighbour, Ayers Rock, for size. The toaster jettisons its load of browned bread. In one corner of the slice a small semicircle of charring backs against an uncooked counterpart. This is the corner Frank butters and bites first. Frank does not eat much. He doesn’t even finish the toast. He pours himself another coffee, turns off the television and heads for his dressing room. Down a high-ceilinged hallway he passes doors to rooms he seldom uses, rooms whose immaculate and expensive furnishings would be under several inches of dust were it not for the ministrations of a cleaning lady Frank has never met. Shelves of books he hasn’t read line one side of the hallway, while on the other side paintings he barely notices any more cover the wall. A fussy-fingered interior decorator from Days chose the books and the paintings and the furnishings on Frank’s behalf, making free with Frank’s Iridium card. Frank has not yet paid off the sum outstanding on the card, so when he resigns he will have to surrender almost everything he owns back to the store. This will be no hardship. His Thursday outfit is waiting for him in the dressing room, each individual item hung or laid out. Frank put the trousers of his Thursday suit in the press the night before, last thing before he went to bed. The creases are pleasingly sharp. He dresses in an orderly and methodical manner, pausing after each step of the process to take a sip of coffee. He puts on a cool cotton shirt with a blue pinstripe and plain white buttons, and knots a maroon silk tie around his neck. He dons a charcoal-grey jacket to match the trousers, and slips a pair of black, cushion-soled brogues built more for comfort than elegance over the navy socks on his feet. Then he addresses himself to the full-length mirror that stands, canted in its frame, in one corner. Patiently he pieces himself in. The clothes help. The clothes, as they say, make the man, and decked out in the very best that the Gentlemen’s Outfitters Department at Days has to offer, Frank feels very much made. The crisp outlines of the suit fall readily into place. The tie and shirt and shoes fill out the gaps. Frank’s head, neck and hands are the last to appear, the hardest to visualise. God help him, sometimes he can’t even remember what his face looks like. Once it manifests in the mirror, its familiarity mocks his faulty memory, but in the moments while he struggles to recall just one feature, Frank honestly fears that he has finally winked out of existence altogether, slipped sideways into limbo, become a genuine ghost as well as a professional one. He makes a point of fixing the time—6.34—in his mental souvenir album. At 6.34 every workday morning, give or take a minute, he has stood here newly dressed in an outfit every piece of which carries a label into which is woven a matched pair of semicircles, one black, one white, above the washing and ironing instructions. Tomorrow morning he will not be standing here. In one of the dressing-room wardrobes a packed suitcase waits. The fluorescent pink tag attached to its handle bears a flight number and the three-letter code for an airport in the United States. A first-class plane ticket sits on top of the suitcase. Tomorrow at 6.34 a.m. Frank will be aboard a silver-tinged shuttle jet, soaring above the clotted clouds, following the sun. One way, no return. He pauses, still unable to conceive how it will feel to be hurtling away from the city, all connections with the only place he has ever called home severed, no certainties ahead of him. A tiny voice inside his head asks him if he is crazy, and a larger, louder voice replies, with calm conviction, No. No. Leaving is probably the sanest thing he has ever done. The scariest, too. Returning to the kitchen, Frank pours himself his third coffee, filling the mug to the brim as he empties the pot of its last drops. Halfway through drinking the final instalment of his breakfast-time caffeine infusion he feels a twinge deep in his belly, and happily he heads for the bathroom, there to succumb to the seated pleasure of relieving his bowels of their contents, which are meagre, hard and dry, but nonetheless good to be rid of. Each sheet of the super-soft three-ply lavatory paper he uses is imprinted with ghostly-faint pairs of semicircles. 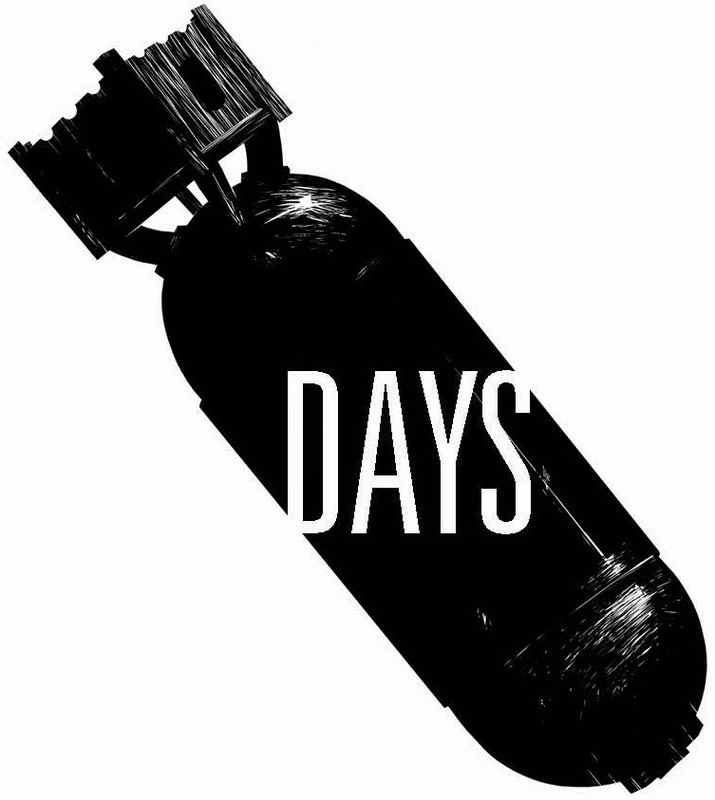 When he was much younger, Frank used to treat the Days logo with almost religious reverence. As an icon, its ubiquitousness indicated to him its power. He was proud to be associated with the symbol. Where before he might have balked at such an act of desecration, now he thinks nothing of wiping his arse on it. In the bedroom again, he straps on his sole sartorial accessory, a Days wristwatch—gold casing, patent-leather strap, Swiss movement. Before he slips his wallet into his inside jacket pocket, he checks that his Iridium card is still there, not because he expects it to have been stolen but because that is what he has done every morning at 6.41 for thirty-three years. He slides the Iridium from its velvet sheath. The card gleams iridescently like a rectangular wafer of mother-of-pearl. Holding it up to the light and gently flexing it, Frank watches rainbows chase one another across its surface, rippling around the raised characters of his name and the card number and the grainily engraved Days logo. Hard to believe something so light and thin could be a millstone. Hard to believe something so beautiful could be the source of so much misery. He returns the card to its sheath, the sheath to his wallet. Now he is ready to leave. There is nothing keeping him here. He spends his second “spare” minute wandering around the flat, touching the things that belong to him, that tomorrow will not belong to him. His fingertips drift over fabrics and varnishes and glass as he glides from room to room, through a living space that, for all the emotional attachment he has to it, might as well be a museum. How he has managed to accumulate so many possessions, so many pieces of furniture and objets d’art, is something of a mystery to Frank. He can vaguely recall over the past thirty-three years handing over his Iridium to pay for purchases which took him all of a few seconds to pick out, but he is hard pressed to remember actually buying the individual items—this Art Deco vase, say, or that Turkish kilim—let alone how much they cost. No doubt the Days interior decorator was responsible for obtaining and installing many of the pieces Frank has no memory of acquiring, but not all. That’s how little the transactions have meant to him, how unreal they have seemed. He has bought things reflexively, not because he wants to but because his Iridium has meant he can, and now he is mired in a debt that will take at least another decade of employment to work off. But as he cannot bear the thought of another day at Days, and as what he owns has no value to him, not even of the sentimental kind, he feels no qualms about his decision to tender his resignation today. To quit, as the Americans would say. (So direct, Americans. They always find a succinct way of putting things, which is why Frank is looking forward to living among them, because he admires those qualities in others he finds lacking in himself.) He has calculated that by repossessing the flat and all that is in it, his employers ought to consider the debt squared. And if they don’t, then they will just have to come looking for him in America. And America is a very big place, and Frank can be a very hard man to find. His tour of the flat is complete. It is 6.43, and he has pushed his timetable to its limit. There can be no more procrastinating. He takes a black cashmere overcoat from the coat rack by the flat door and flings it on. The door clicks softly open, snicks snugly shut. Frank steps out onto the landing, part of a central stairwell that winds around a lift shaft enclosed in a wrought-iron cage. He keys the Down button by the lift gate, and there is a whine and a churning of cogs from deep down in the shaft. The cables start to ribbon. 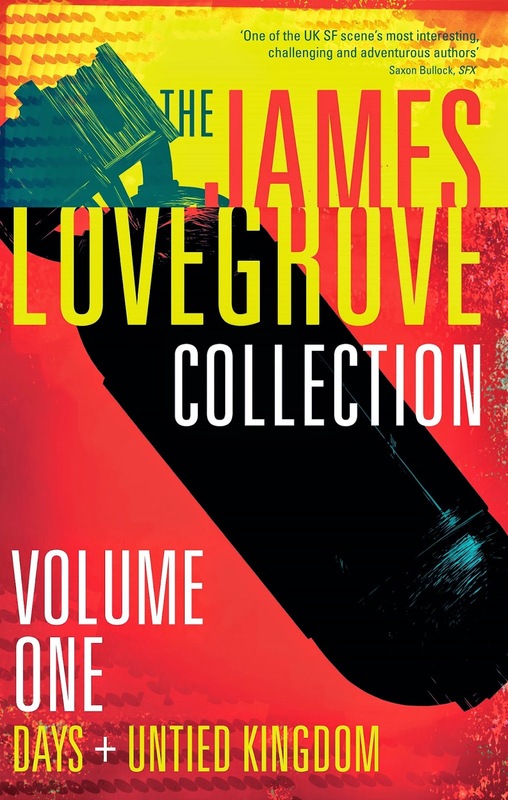 The James Lovegrove Collection: Volume One is out December 2014 and is the first in a three part retrospective of the early works of James Lovegrove.